One of Trump’s loyal subjects and the U.S. Ambassador, Nikki Haley, took a virtual beating at the United Nations meeting. The Twitter video below via Now This shows Haley begging other ambassadors to sign her Trump/U.S. Gaza Resolution. 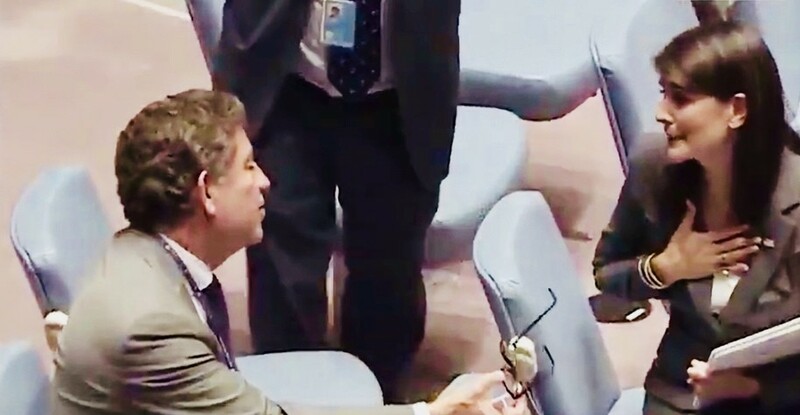 At one point in the video, with hand over her heart, Haley appears to be asking one ambassador, “Oh, please.” But her desperate attempts were to no avail leaving her in a very awkward situation. She then, in Trump style, tries to bully and threaten the entire U.N..
One ambassador said that he never, in the history of the U.N., had seen a resolution shot down the way Haley’s was. Here is the Now This video. With some videos, it’s easier to just read the transcript. I would recommend watching this one. It’s too good not to.